If you have had a heart attack, eat plenty of fibre because it may improve your long-term chances of recovery, say US researchers. Heart-attack survivors were more likely to be alive nine years later if they followed a high-fibre diet, a study in the British Medical Journal found. Every 10g-per-day increase in fibre intake was linked with a 15% drop in death risk during the study. Dietary fibre may improve blood pressure and cholesterol, experts say. On average, most people in the UK get about 14g of fibre a day, against a target of at least 18g. US experts recommend up to 38g a day. Fruit, such as bananas and apples, root vegetables, such as carrots and potatoes, wholemeal bread, cereals and bran are all good sources of dietary fibre. A low-fibre diet is associated with constipation and gut diseases, such as diverticulitis and bowel cancer, but it may also have implications for heart health, say US researchers. They were followed for an average of almost nine years after their heart attacks, during which time 682 of the women and 451 of the men died. Chances of survival appeared to be linked with fibre intake, which was mostly from breakfast cereals. The one in five who ate most fibre had a 25% lower chance of dying from any cause during the nine years after their heart attack compared with the fifth who ate the least. The high-fibre group was 13% less likely to have a fatal heart attack. The researchers say the findings point to a simple lifestyle step that people could take, alongside their medication, to improve their long-term health prospects. Victoria Taylor, of the British Heart Foundation, said: "High-fibre foods are a key part of a healthy balanced diet, and this study suggests they may have a particular benefit for heart-attack survivors. "We can't say for sure what caused the fibre benefit seen here, but we do know that, on average, we're not getting enough fibre in our diets. 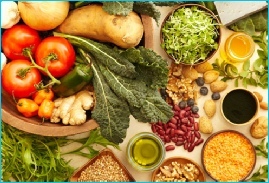 Fibre comes from a range of foods, including fruit and veg, beans and lentils, and also from cereal products, which this study found to be particularly beneficial. "To get more fibre, you can make simple swaps, such as trading white bread for whole grain versions or opting for higher-fibre breakfast cereals, like porridge or muesli."